I got a nice birthday present from my garden this year---a big, fat, round, turnip! I've never grown one this pretty in all my life. If you don't like turnips that's probably because you've never had them picked fresh from the garden, peeled, cubed, and steamed, then served with with salt, pepper, and butter. It was a treat. AWESOME! what a beautiful turnip! 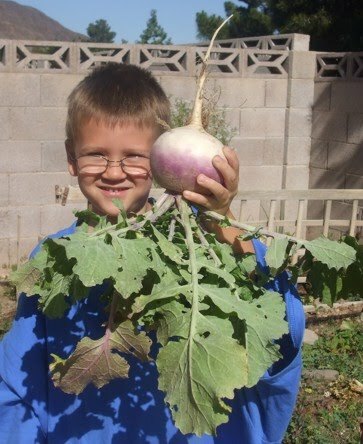 Our growing season is so short we're lucky if turnips reach the size of a ping-pong ball. Wow! I can't believe how big that is. I've really been enjoying the home-grown garden tomatoes we've been getting, though. Oh, Rob, I wish we could get tomatoes here! I think maybe this year I've figured it out and there are a few little green knobs growing on my plants. Maybe this summer.